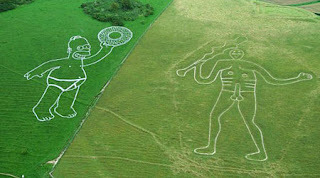 Giant Homer Simpson created next to Cerne Abbas Giant! To promote the new Simpson's movie a team of artists have created a giant Homer Simpson next to the Cerne Abbas Giant, pagan fertility symbol on the Cerne Abbas hills in Dorset, England. Apparently Homer is painted using paint that will dissolve when it rains - great media idea but given current weather assume it won't be there for long! This continues the innovative marketing around the theatrical release of the Simpsons Movie. Simpsons Movie turn 7-Eleven's into Kwik-E-Marts!